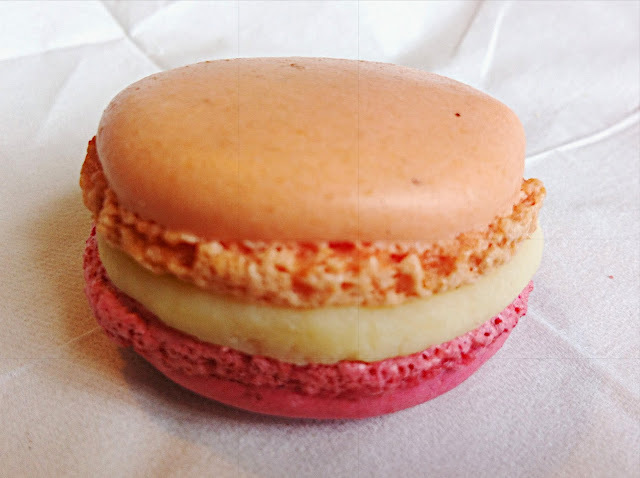 My love affair with the macaron is immeasurable. 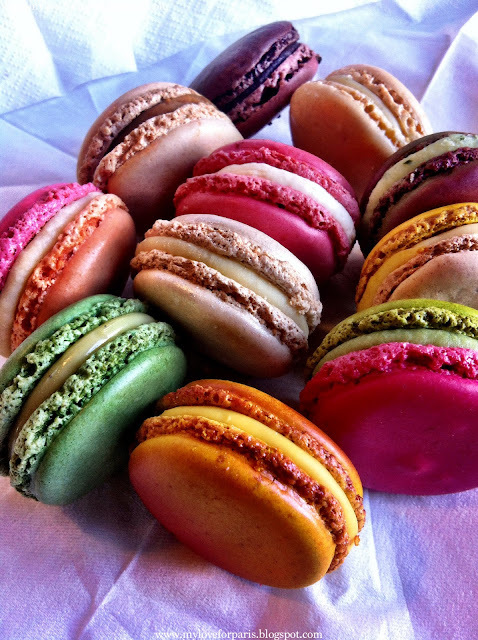 I love everything about the macaron. 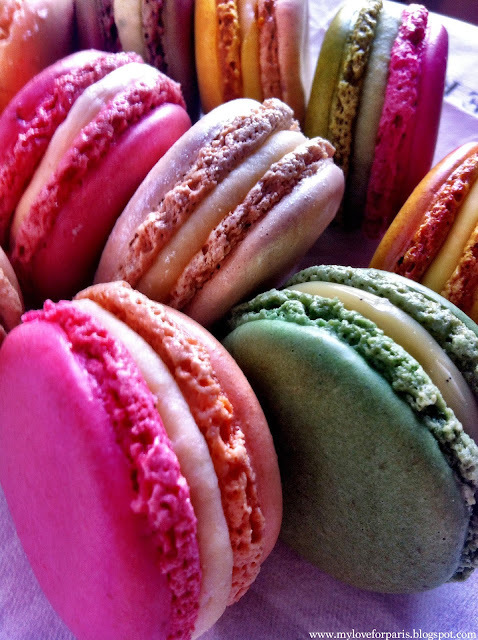 I love how the word macaron sounds in French, I love the beautiful colours. 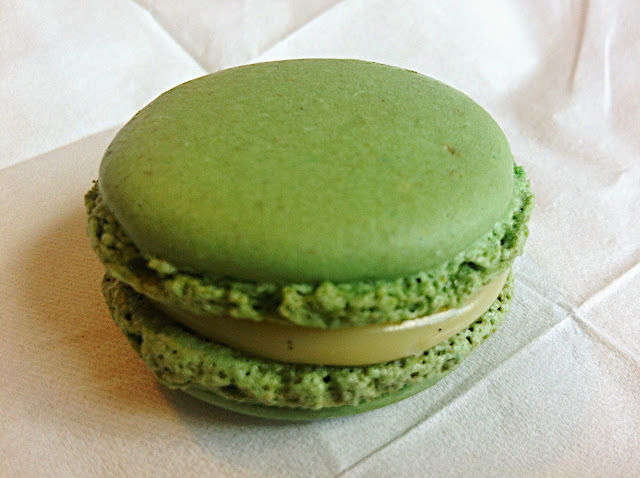 I love the subtle fragrance of macarons. I love how incredibly photogenic they are. I love their cute shape and petite size that fits ever so neatly between my fingers. I love the round delicate crispy shell and its slightly chewy interior. I love the generous ganache, the rich but not too rich buttercream, the delicious filling that always looks like it gently wants to overflow out of those shells but never does. 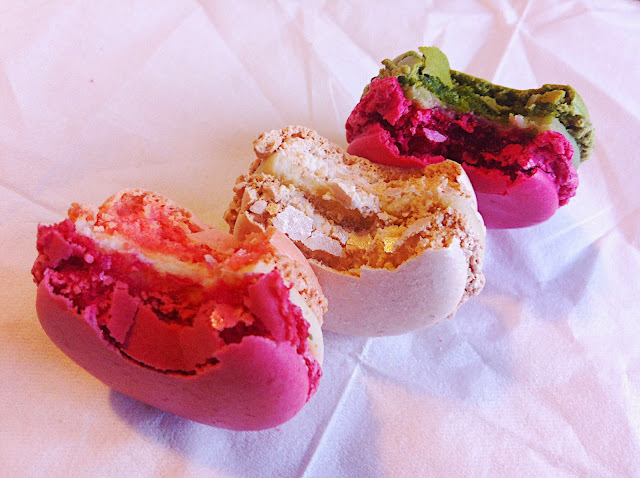 I love sinking my teeth into a macaron and closing my eyes, experiencing the different textures on my palate and explosion of intense yet subtle flavours in my mouth. I was first introduced to the macaron by my friend who was living in Paris in 2008, she was also the one who introduced me to Rob Ryan, she's taught me a lot that girl! I was visiting her for her birthday that year from London where I was living at the time I distinctly remember she came to meet me at Gare du Nord with some macarons. My life was never the same again after that day, where had they been all my life..? 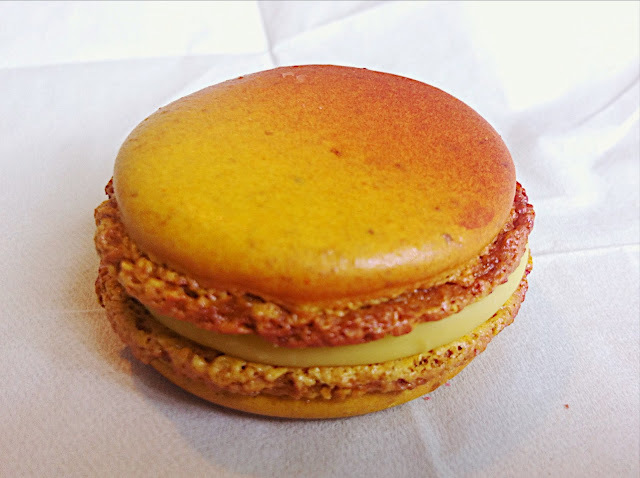 Anyway, so last year, I found out about the existence of this Macaron Day, Jour du Macaron started by Pierre Hermé, just after it had already passed. I was gutted knowing that I would have to wait another year. So as you can see, I have been waiting for this day for a long time. 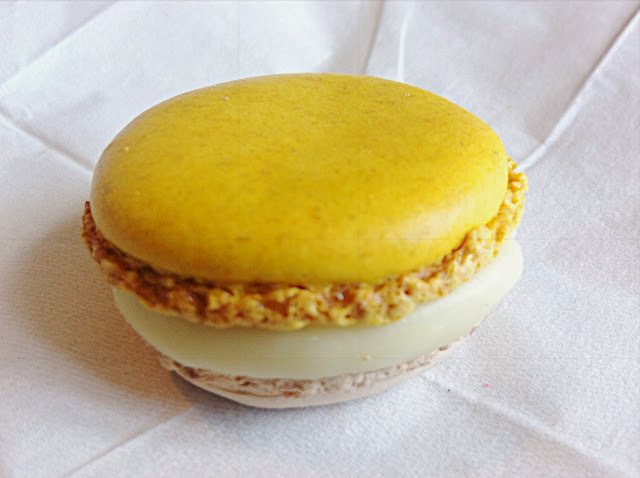 The two main players in the French macaron world are Ladurée and Pierre Hermé. 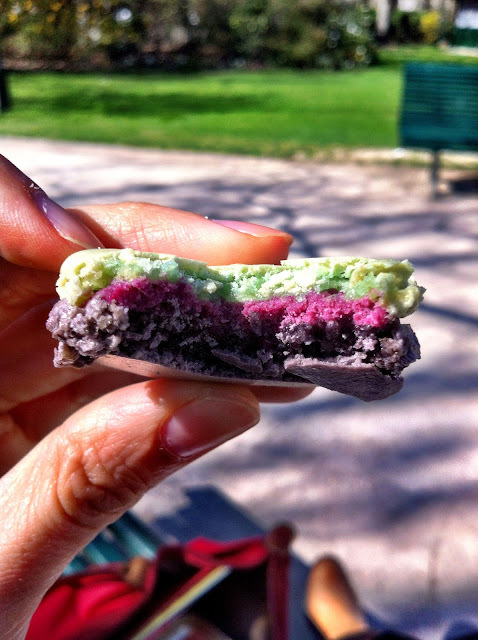 There are many many other delicious macaron houses in Paris but these are the two main camps. 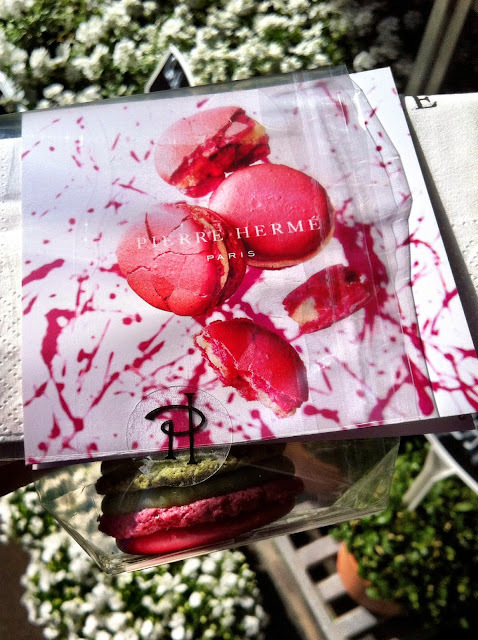 For many, you are either team Ladurée or team Pierre Hermé. For me, I love both. I can't decide yet. I haven't quite made up my mind which is "better" because I need to reach my definitive conclusion methodically. You know, randomised controlled double blind taste test type thing involving identical flavours and identical storage conditions etc. The only problem with this macaron habit is that it's not cheap. At 1.90€ a pop at Ladurée and 2.05€ at Pierre Hermé, it can get expensive. 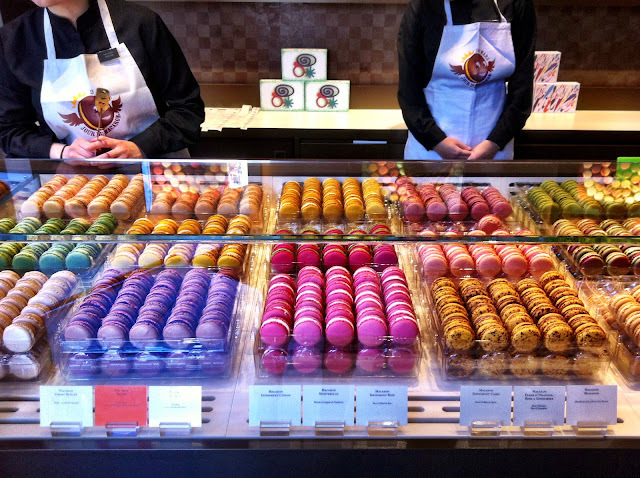 Plus, to be honest it takes a lot to be able to leave a macaron store with only one macaron. 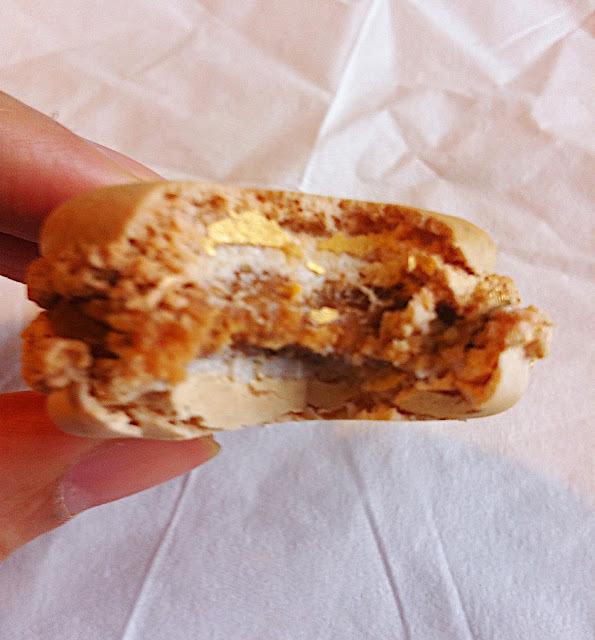 Jour du Macaron was the perfect idea. In its 9th consecutive year, this event was started by Pierre Hermé and some other members of the Relais Desserts Association to bring together different macaron houses and raise money for charity. 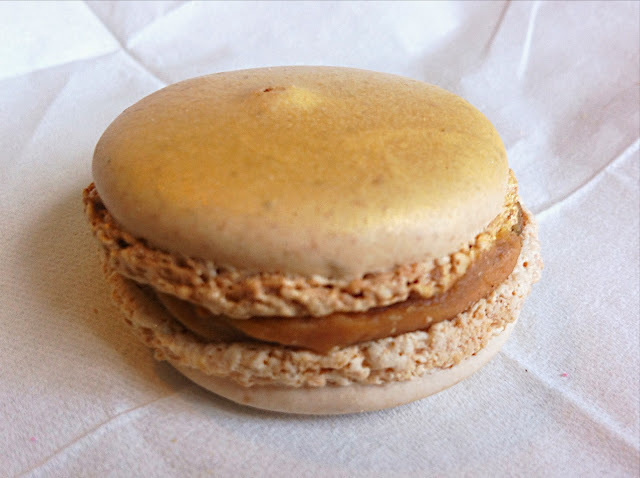 The idea was that you could make a donation in exchange for a macaron. 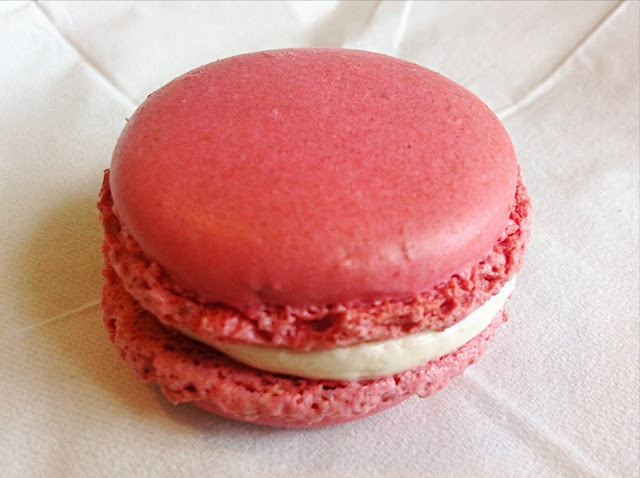 One donation = one macaron! 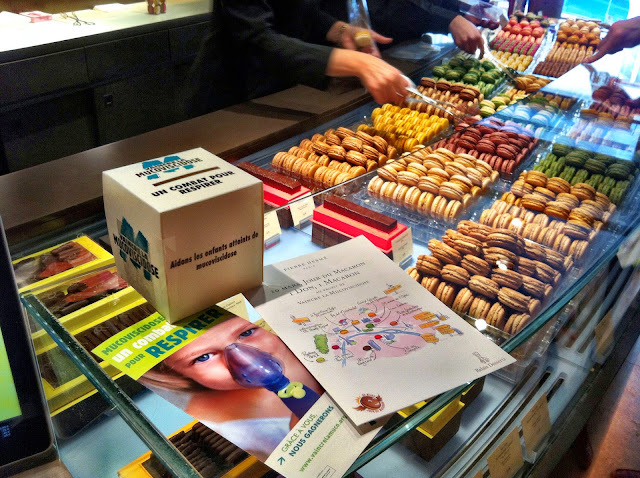 This year, the donations in France helped to raise money for the fight against cystic fibrosis. So this was my plan, I figured a 1€ donation was enough to not appear too cheapskatey and at the same time representing a ~50% saving. 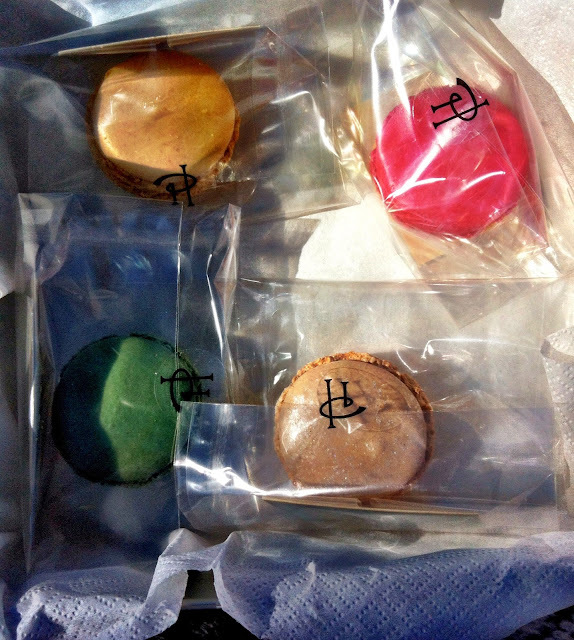 10€ for 10 Pierre Hermé macarons that would help out a charity at the same time? What a bargain! 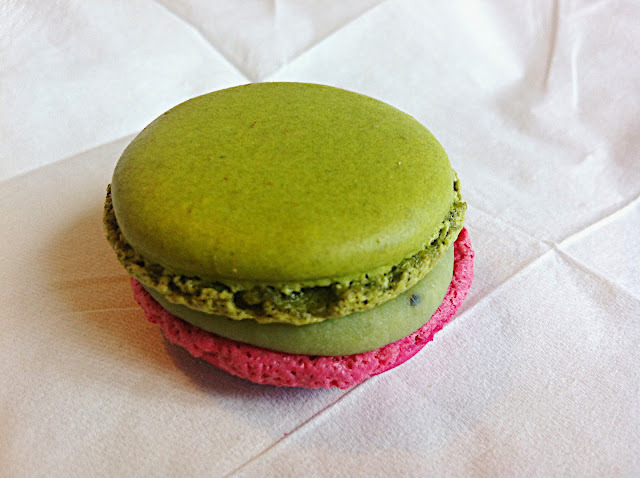 Now all I needed to do was hop around to the different participating macaron houses from this list. My first stop was Galeries Lafayette. 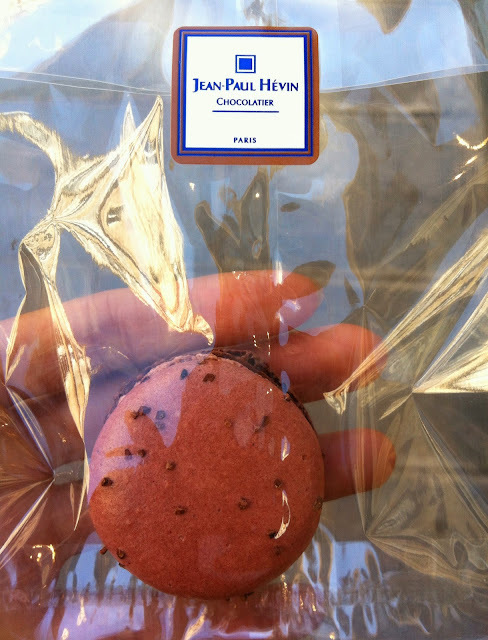 Great choice because there would be 3 Pierre Hermé stations (house, shoes and level 1 womens), 1 Jean-Paul Hévin (food), 1 Sadaharu Aoki (food - which sadly wasn't participating this year, only the boutiques were) and 1 Dalloyau (food - which also sadly wasn't participating). 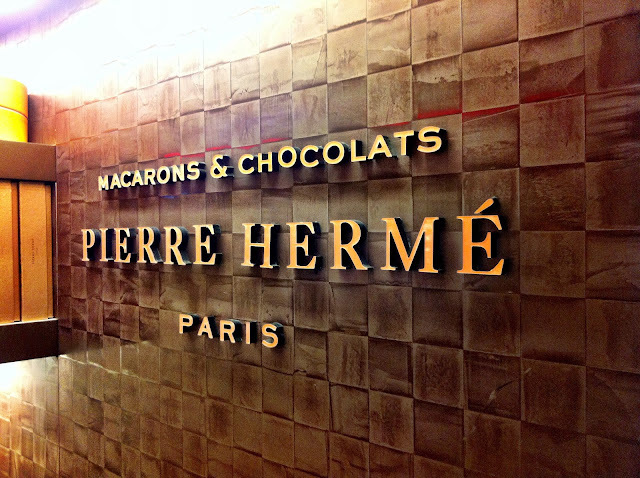 Next closest Pierre Hermé was on boulevard Malesherbes, which was within walking distance. Woo hoo, I had collected 5 macarons for 5€ so far! 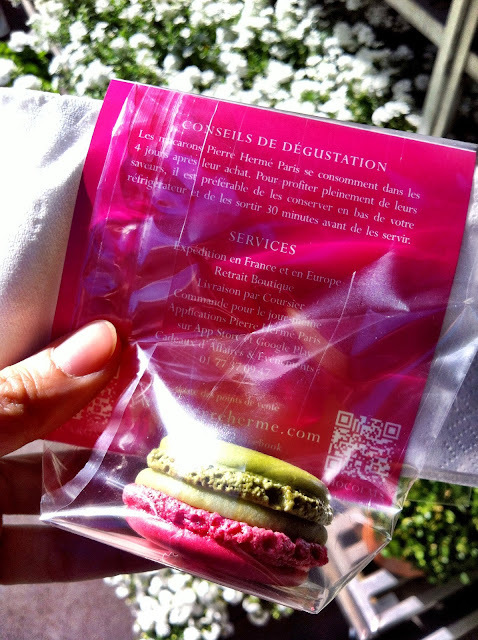 The hunt continues as I try and visit the other Pierre Hermé stores and collect my pretty macarons. 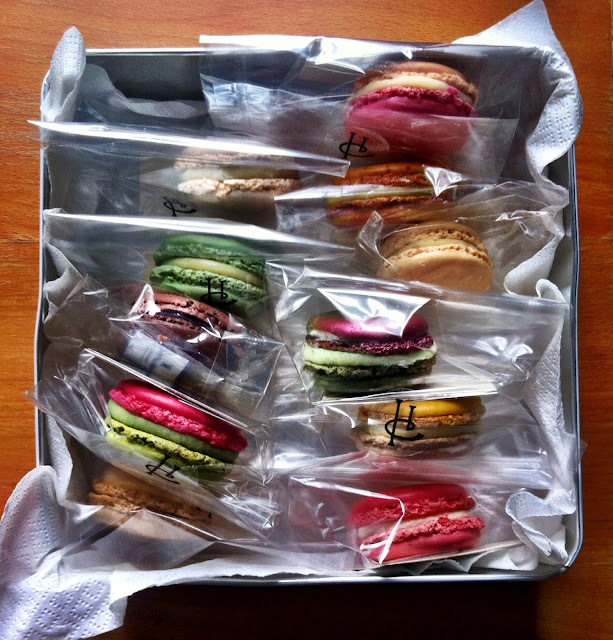 By the time I make it home, I had collected 12 macarons (well 11 because I ate one in the park). Youpi! (as the French would say, it's their cute equivalent of our "yipee"). 12€ for 12 macarons. They were sitting there so prettily I was scared to eat them because they just looked too perfect all individually wrapped up. So I took them out and we had a little photo shoot. Apologies in advance but there are a lot of photos up ahead. Let's just say I got a little bit excited. Look at these pretty things..! It's not finished. I even did individual shots. I couldn't help it. I got carried away, I'm sorry. Wild rose (églantine), fig and foie gras! See how the filling wants to ever so gently spill over but it never does..? All so delicious with such incredibly creative flavour combinations. 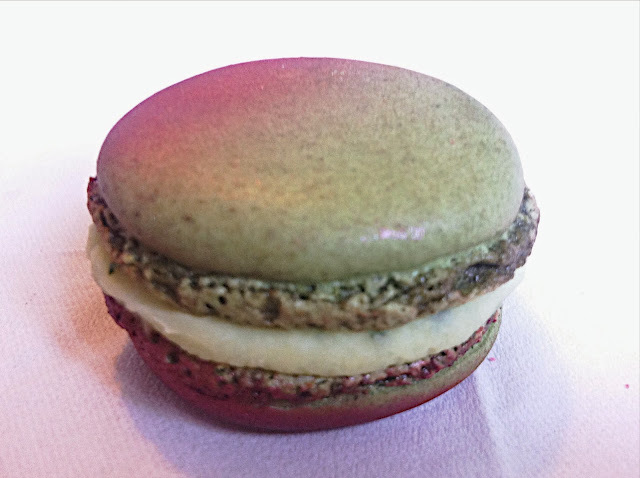 I must say stand out flavours go to the savoury foie gras one (more for the experience of a savoury macaron than the taste as I prefer them sweet), jasmine (beautifully subtle!) and céleste (love the passion fruit, rhubarbe and strawberry combination). Don't get me wrong, I loved all the flavours but these were the top 3 of the day (according to my palate). 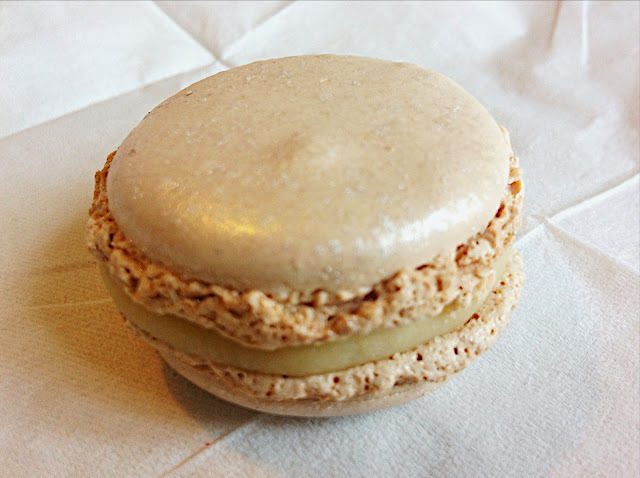 Now, great news is that Jour du Macaron has expanded over the past 9 years. 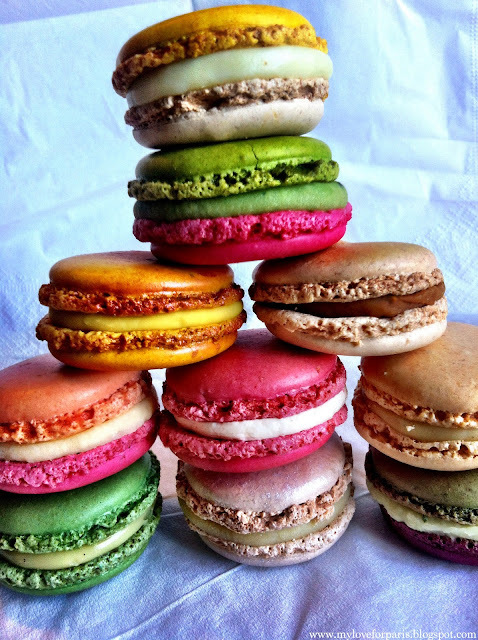 Many cities around the world are now participating in Macaron Day in the name of charity. 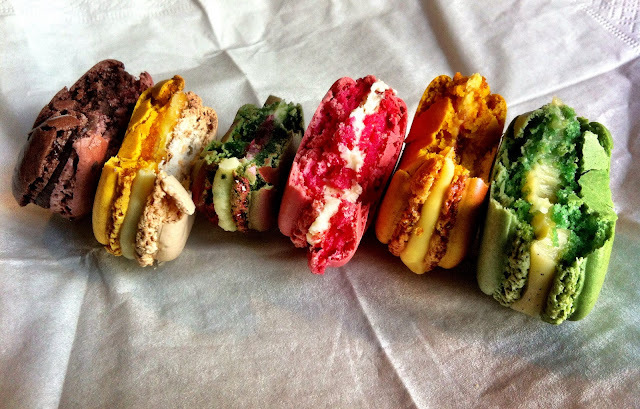 Simply googling macaron day will return hits in New York, Toronto, London just to name a few. So grab your coins and go on the annual macaron hunt as Jour du Macaron has been extended to cover the weekend - ie Thursday 20th, Friday 21st, Saturday 22nd and Sunday 23rd at certain stores! Thanks Thuy! My amateur macaron photo shoot was so much fun, forgot how cool it was to play with your food! You'll be converted one day ;) you just need to find a macaron that's not too sweet, whose shell isn't too crunchy and whose ganache and shell interior resemble more of a brownie..!